Product #17327 | SKU PMW300K2 | 0.0 (no ratings yet) Thanks for your rating! 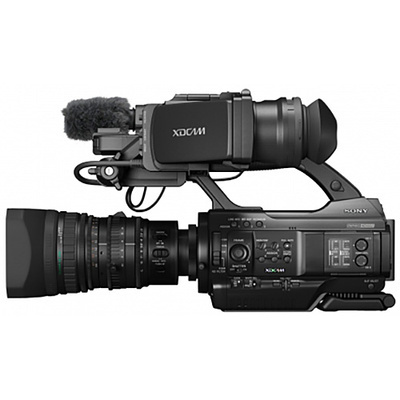 The PMW-300K2 XDCAM HD Camcorder from Sony is designed to meet the demands of field video productions and professional studio applications. It is Sony's first semi-shoulder mount camcorder to combine the low-light capabilities of three, 1/2" Exmor Full HD CMOS sensors with the broadcast-quality, Full HD MPEG HD422 codec. The camcorder features the same rugged metal construction and interchangeable EX lens mount as the PMW-EX3, but introduces a 16x Fujinon HD lens and advanced signal processing technology for low-noise and clearer images. The PMW-300K2 also features a 3.5" 960 x 540 LCD viewfinder, built-in ND filters, and 8 assignable function buttons. The camcorder offers two HD/SD-SDI and one HDMI inputs, as well as i.LINK, USB 2.0, timecode, and genlock connections for use with a wide range of AV and IT interfaces. The USB 2.0 port enables the use of the optional CBK-WA100 Wireless Adapter. Included with the camcorder is the Fujinon 16x zoom lens with lens hood and cap, 3.5" LCD viewfinder, BP-U30 battery and charger, infrared remote commander, shoulder strap, cold shoe kit, and a USB cable. Interchangeable lens system with 16x Fujinon HD lens package. Continuous recording (creating a single file with multiple start and stop REC trigger). Multi-camera operation with 8-pin remote control.